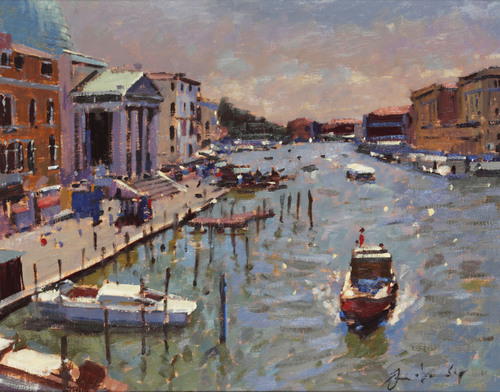 The Catto Gallery is hosting their sixth solo exhibition of recent oil paintings by Bruce Yardley, from 8th until 26th June, 2008. The exhibition will feature recent views from New York, Venice and London viewed from the water, together with his home town of Bath. It is in these works that Yardley’s brisk brushwork and mastery of shadow captures the atmosphere of each of these cities. Impressionism is certainly the benchmark for Bruce Yardley's work and he follows the great tradition of the New English Art Club and such artists as Ken Howard and Bernard Dunstan. "Light and composition are the forces that make me paint", comments Bruce. The strength and beauty of any picture of note is the emphasis on the vertical and horizontal, and the structure of the work. Yardley expertly combines these key essential elements with a superb handling of light to create spatial illusion and a genuine sense of perspective perhaps inspired by the work of British Impressionist La Thangue. His works capture the effects of light be they brilliant or subdued, with figures featuring prominently, either in the composition or as a focus. Following recent trips to France, Italy and the States, Yardley has in his recent works moved away from his favoured studies of figures and interior still-life studies. He now focuses on cityscapes, as can be seen in his nocturnes of the Thames with Tower Bridge and the Houses of Parliament on the horizon and street scenes. Also in his street scenes, where Yardley gets under the skin of a city, be it the long shadows on ‘Cannaregio Fondamenta Della Sensa’, in Venice, hurrying pedestrians in a wet New York on ‘East 48th Street’, or the casual observation of ‘Christmas Decorations in Great Pulteney Street’ in Bath. Each work draws the viewer into them. Although figures are still an important part of the composition of Yardley’s paintings, be they highlighting the bustle of ‘Fifth Avenue’, or the contemplative air ‘In the Pump Room, Bath’. And in ‘Caroline, Turquoise and Gold’ the figure is once again the focus of the painting offering the viewer, an intimate moment with the subject. For further information, images and a catalogue of the forthcoming Bruce Yardley exhibition, contact The Catto Gallery, 100 Heath Street, Hampstead. Working in oil Bruce has evolved a brisk painterly style that captures movement and atmosphere. His pure impressionism is evident from his brush marks and his subjects: Boudoir studies of the model, still lifes and interiors. However it is the overriding subject of light that influences his choice of subject often travelling to France and Italy for inspiration. This press release was distributed by ResponseSource Press Release Wire on behalf of Cassleton Elliott in the following categories: Men's Interest, Entertainment & Arts, Home & Garden, Women's Interest & Beauty, for more information visit https://pressreleasewire.responsesource.com/about.